Occasionally Andrew Thornton of The Writing and Art of Andrew Thorton will put together mixes that are available for purchase. The idea is that we purchase a kit and then using the components from the kit, we put together a piece of jewelry to show off on a designated day. Well today is the day and first of all, I wanted to show you the goodies that I got from Andrew. Lots of lustrous beads and Waxed Linen. There was also a mystery component that became the focal of my necklace. I didn't end up using a lot of the beads simply because they weren't the style that I was aiming for. I wanted a necklace that I got wear this summer with a pair of jeans or shorts. I used the rustic focal that Andrew sent, some of the seed beads, what I think is vintage czech glass, the clasp and the waxed linen. 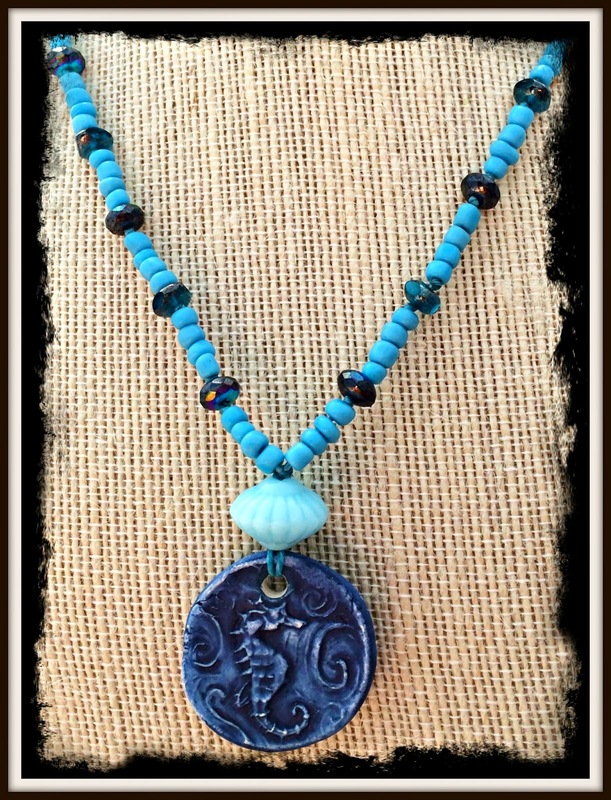 I just love the different color blues in this necklace because it gives me so many different options. 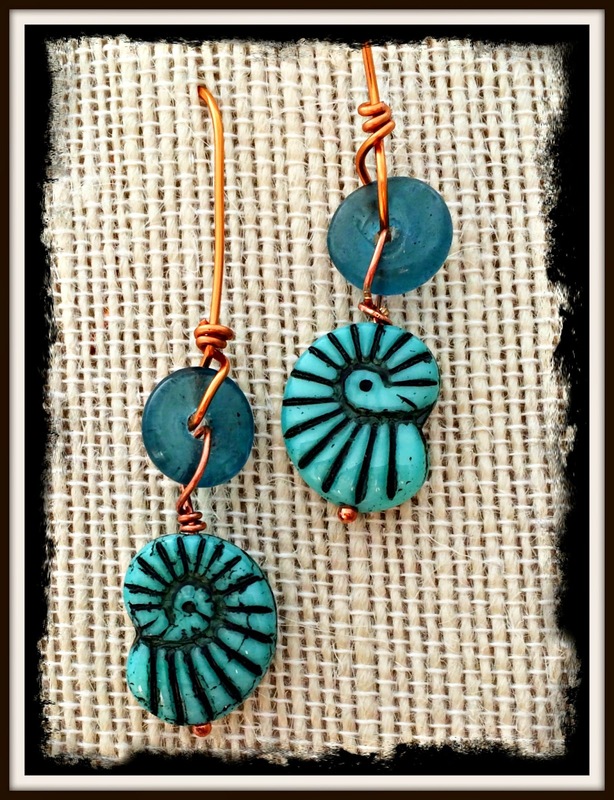 I also used these rustic glass and nautilus beads to make these earrings for Ears To You. Yes they look familiar because I messed up and already posted them. 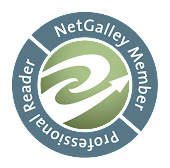 There were more then a few of us that participated in this blog hop. 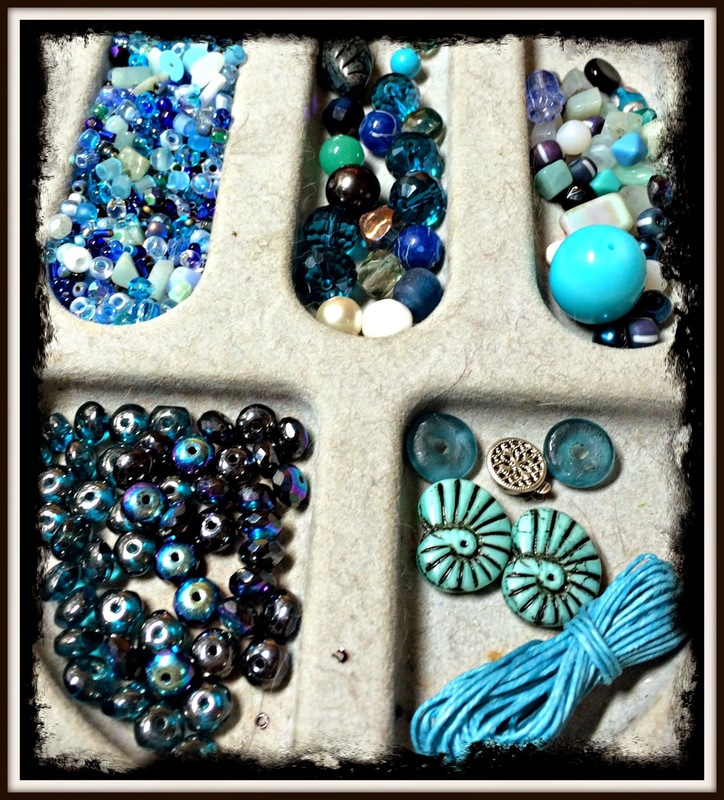 Be sure to visit everyone to see the different ways we used the same beads. Loving the blues and the casual feel of this necklace! the earrings are very pretty too. Your necklace is so pretty. Blues are my favorite. I can definitely see this w/jeans or shorts for the summer, just as you mentioned! Pretty earrings, too - great that they are going to 'Ears to You'. Sha your necklace is simple but beautiful and the earrings are my color. I hopped earlier, but didn't get a chance to post until now. The pieces that you created are really great! I love how wearable and classic your necklace is! (The bigger, fluted bicone is vintage Japanese glass from the 50's.) The earrings are also fun! I love the contrast of the wire to the glass! Both of the pieces are fantastic! Thank you so much for participating! I really enjoyed seeing what you made!